Unwind in our stunning Wine Bar every Wednesday all year round. 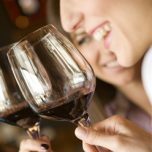 We offer over 50 wines by the glass - 1/2 price for women! SO MUCH FUN! Men are welcome too!